The veiled statue of late Chief Minister Beant Singh has gathered controversy. Gurkanwal Kaur, daughter of late CM and former Punjab minister and Arun Walia, president, District Congress Committee, have accused a section of Congressmen. While the SAD-BJP government has decided to review some controversial BOT (build, operate and transfer) contracts awarded to some private companies by the local bodies department during previous Congress regime, it is going to formulate a policy on BOT projects in the near future, according to local bodies minister Manoranjan Kalia. 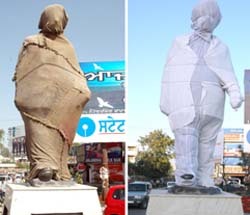 The veiled statue of late Chief Minister Beant Singh has gathered controversy. Gurkanwal Kaur, daughter of late CM and former Punjab minister and Arun Walia, president, District Congress Committee, have accused a section of Congressmen of downplaying the late Chief Minister’s sacrifice. They also hold the SAD-BJP government responsible for failure in protecting the statue. Interestingly, the party again witnessed factionalism at the Rajinder Nagar based Congress Bhawan. Neglecting the arrival of Gurkanwal Kaur and Arun Walia, prominent Congress leaders, including, Mayor Surinder Mahey, and former ministers Avtaar Henry and Mohinder Singh Kaypee did not turn up at the bhawan. “I think our leaders have got too busy,” was the terse comment of Gurkanwal. She accompanied by leaders Arun Walia and Vijay Khullar, seemed upset on the statue issue. The statue was installed at the BMC chowk by the Jalandhar Municipal Corporation in the second week of December, but, it could not be unveiled for a couple of reasons. It was scheduled to be inaugurated by former minister Chaudhary Jagjit Singh, but, things did not take place the desired way. While some say that widening fissures within the Congress were responsible for the much talked about stagnation on the statue front, others say that the statue could not be unveiled for the poll code came in its way. But a larger section of the Congress agrees that disagreement worked more than the code and that the statue was laid at the place at least 10 days before the code came into force. The statue came into limelight when either some unscrupulous elements removed its jute cover or it got removed by vagaries of nature. Ironically, though, Gurkanwal Kaur kept talking about the failure of the SAD-BJP government for protection of the statue, but, she did not say anything about the laxity of the local Municipal Corporation, which, is still controlled by the Congress and which, is still headed by its own leader Surinder Mahey. “We will hold dharnas to lodge our protest against desecration of the statue apart from giving a memorandum to the DC for seeking arrest of the persons responsible for it,” said Gurkanwal and Congress leader Varinder Sharma. She also reminded people about the unparalleled sacrifice of her father for Punjab. “Sardar Beant Singh laid his life to curb militancy. But, I think that certain people have forgotten his sacrifices. Former Chief Minister Amarinder Singh, however, attended two of his anniversaries,” Gurkanwal added. It would be incorporated in the policy that the local bodies department would execute most of the projects on its own and only a few projects would be allotted to private companies, he said. To a query, the minister said that some controversial BOT projects allotted during the Amarinder Singh government would be examined, but work on such ongoing projects would not be stopped to avoid any inconvenience to the public. Several BOT contracts worth crores were awarded to some private companies in different cities of the state during the previous Congress government. Then leader of opposition in the Jalandhar Municipal Corporation K.D. Bhandari, now BJP MLA from Jalandhar North, had also raised the issue of alleged corruption in the allotment of BOT projects at the meeting of MC. Meanwhile, talking to The Tribune, Bhandari alleged that several crores of rupees exchanged hands while allotting BOT projects, including two foot overbridges near the bus stand and BMC Chowk, a rail overbridge on the DAV College level crossing, basement parkings near Company Bagh and Jyoti Chowk in the city.